While mines are safer today than they were in the past, miners are still being injured, maimed, and killed, and the incident and severity rates for the mining industry are still higher than those for most other industries. What's more, fatality rates are higher in the Nation's smaller mines and highest in the smallest mines. 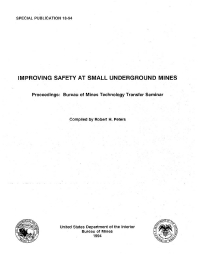 What can be done to improve safety in small mines? One key to improved safety is worker performance. To be effective, companies need proactive safety interventions involving training, changes in policies or procedures, and/or modifications to equipment that address mine-specific needs and eliminate situations where the miner's actions unnecessarily expose him or her to hazards. While outside resources such as governmental agencies, academic institutions, and equipment manufacturers can provide assistance to mine operators, it is up to individual mines and companies to develop effective safety programs. This paper reviews the basics of developing safety interventions aimed at improving worker performance and describes approaches for maintaining program effectiveness. This information is based on research conducted at West Virginia University under U.S. Bureau of Mines Cooperative Agreements C0167023 and C0178052. Emphasis is given to identifying performance discrepancies (hazardous behaviors) by observations (safety sampling), accident data analysis, and input from workers and supervisors.